We had a quiet day around TT Peace River today. A little pickleball this morning for me while Chris continued working on her nutrition course. Teddy enjoyed his time out under the awning in his pen stirring on occasion to remind us it was time for his walk. Bob & Julie joined us for supper outside this evening. Chris made a great lasagna with freshly made bread, garlic butter and salad. We followed that up with a little euchre. Guys against the ladies and the ladies won….again. I managed to spend some time on the river bank with my camera before supper. 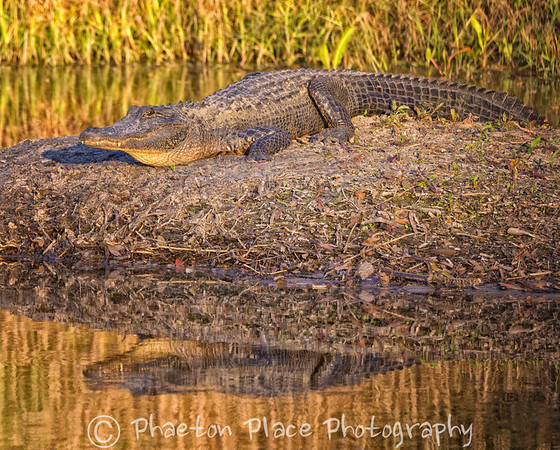 The late afternoon light made for some very warm tones as evidenced in today’s gator photo. Lots of interested looks as I stood on the bank with my 500mm lens mounted on my tripod taking photos of this very patient alligator. I’m pretty sure it isn’t the same gator we saw yesterday afternoon. This one looks to be a little smaller and also has all four of it’s legs whereas yesterday’s gator looked to be missing the right front leg. There are probably a half dozen gators in the river plus some across the road at Pioneer Park as well so I suspect they get around a fair bit. This entry was posted in Campgrounds, Internet, iPhone, Photography, Technology. Love the gator … double the pleasure with the reflection.